The Crystal Maze Win Zones arrived at Star Spins during September 2018. Drawing inspiration from the hit TV series, this is a 5 reel 25 payline slot that immerses you into The Crystal Maze experience. The game has a futuristic feel to it but is quite limited in terms of features. 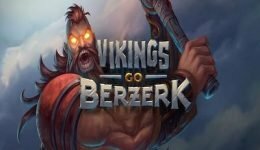 There’s a Wild Zones Free Spins Bonus and a Colour Connect Feature. However, these can generate big wins. Will you be successful in The Crystal Maze Win Zones? When you open up the slot the soundtrack to the TV show kicks in. Sadly there’s no evidence of any presenters or characters from the series. Instead you’re greeted with a neon stylised slot game with various symbols. These include futuristic, medieval, aztec and industrial zone icons plus low value symbols such as a question mark, dumbbell, light bulb and crossfire target. These are all joined by a Crystal Maze logo, a crystal and a bonus symbol. The latter is the top paying symbol at x1000 for 5 of a kind. Wagering on the slot starts at 25p (1p per line) but can be increasted to £200 (£8 per line). As is typical for Gamesys slots there’s no autoplay feature. However, The Crystal Maze slot is compatible on all devices. We would love to see autoplay included even at a basic level. It’s a mystery why it’s not part of the latest games from this camp. 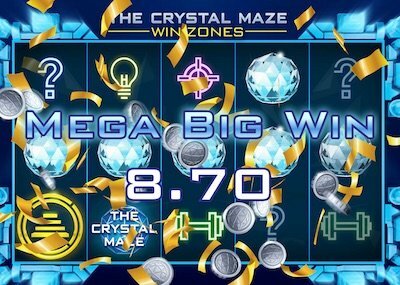 The Crystal Maze Win Zones slot comprises of two main features. 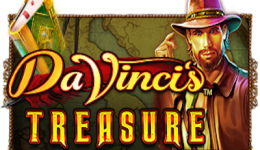 Three or more bonus symbols, landing on any reels, activates the Win Zones Free Spins Bonus. Eight free spins are awarded as standard but these can be increased to include Super Spins. During the free spins, the reels tranform into each Zones’ colour for 2 free spins each. The colour connect feature then activates in the same way as the base game (see below). Any Zones that land in their colour during the first free spins result in an additional Super Spin at the end of the round. The Colour Connect Feature can result in the reels transforming into 1 of 4 colours – representing the four zones. This can occur at random during the base game. It’s blue for futuristic and this results in up to 5 symbols being converted to wilds – plus more for each futuristic symbol. Get green for the medieval zone and sticky wilds that remain for respins until no new Medieval symbol land. The yellow aztec zone simply creates expanded wilds whilst the purple industrial creates up to 4 wilds in a diagonal. We quite enjoyed spinning on The Crystal Maze Win Zones slot. The developers have done a good job in turning the basics of the TV show into game worth checking out. The colour connect feature can be a little baffling, but it’s your best bet for big wins. The bonus round is a rarity but when it shows up there’s little variation from the base game. This makes the game feel quite one dimensional after a few hundred spins. That can be said for many slots, but this game needs something a little extra to remind you what it’s based upon.